So what's the deal with "Subabrew Snowshoe duex x duex"? Date set yet? I might try to make it to WRC Mexico. Krinkov is planning 2/28-3/3. 2/29 - 3/2 <---- !Viva la Mexico! But with this South o' da Border WRC going off, it seems that we should be looking to do the Subabrew Snowshoe Deux Fois Deux on the wknd two weeks after that, which is the last one on our list. So the wknd before Easter... Fri, Mar 14 thru Sun, Mar 16.
there should be another storm over through this week, so i wouldnt be surprised if i make it back next thursday. from Southbay 3hr trip left at 4:30AM was suprised. Snow was semi iced over powder, but really nice groomers, i played in "the drain" all day going back and forth doing wallrides, surfing, hips. Kirkwood is too steep IMO, unless its a powder day. Otherwise the runs are super short just because of the super steep mountain but i love that drain under the Cornice lift at the bottom, so much fun, did it 8 times or so. clear drive up, snow on the way down. 88 to 99 do you take Liberty or 8 mile to 99? or go 88 all the way to 99 which seems longer to me. Asking since i passed a guy on 88 and saw him on 99 when he took 88 the whole way. just dropped my board off to get waxed, i'm hoping to go up next week, maybe tuesday... probably just boreal though cuz it's cheap and i'm broke. anyone been there recently? just got back from boreal..tons of snow to board..unfortunately right when I left to go back home it started snowing, and now it aint gonna stop snowing for weeks due to this storm comin in....so I just missed all the fresh power =(..oh well, ill hit it up again this weekend.. So I'm goin' to Mexico for WRC. Last weekend of Feb is out for me. no mexico for me. not enough dough with 3 cars is pieces. I am however planning on riding this weekend so anyone that wants to go let me know. But with the South o' da Border WRC going off, we should shoot for a couple weeks after that to do the Oh-Eight Suba- & Snowshoe- BrewFest. Ya know... maybe help Jeff's & Jeremy's wallets & brain cells w/ some recovery time. So whaddaya think? The wknd before Easter... Fri, Mar 14 thru Sun, Mar 16? Ya know... maybe help Jeff's & Jeremy's wallets & brain cells w/ some recovery time. Now that's very kind of you. anyone free to ride bear with me tomorrow? My work is cutting my hours and I have tomorrow off. Figure I might as well do something with my time besides sit in the rain. possibly leave tonight and crash at my place in arnold. I went 88 to Kirk and saw NO subarus! i mean i saw Subarus of course but not SUBARUS! 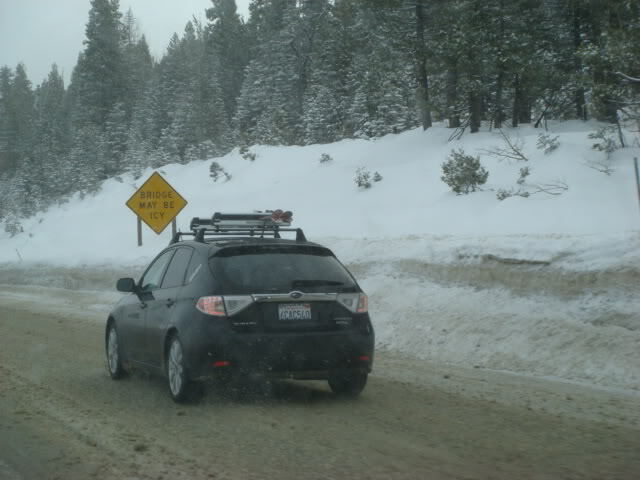 I saw a Red 08, maybe STi going up 9 to the snow this AM at 7 when i was coming down.